We often use Electromagnetic flow meter as digital water flow meter, this digital water flowmeteris powered by 24V DC,220VAC or battery , it has digital display to indicate instant flowand total flow, it can also output 4-20mA ,pulse output, it can even have RS485,MODBUS RTUcommunication. 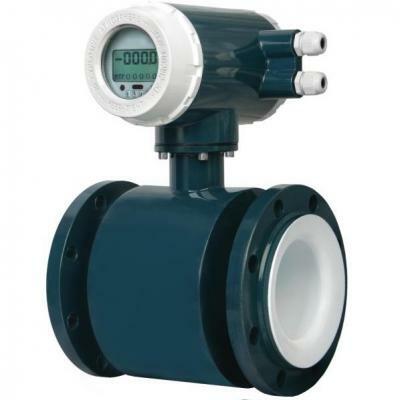 Mag flow meter is composed of two parts: sensor and converter. It is based on Faraday's law of electromagnetic induction, which is used to measure the volume flow of conductivity over 5 mu S/cm conductive liquid. It is a kind of induction meter measuring the volume flow of conductive media. In addition to measuring the volume flow of normal conductive liquid, it can be used to measure the volume flow of strong corrosive liquid, such as strong acid and alkali, as well as mud, pulp, etc. It is widely used in oil, chemical, metallurgy, light spinning, paper making, environmental protection, food and other industries and municipal management, water conservancy construction, river dredging and other areas of flow measurement. Digital quantity processing with strong anti-interference ability, reliable measurement, high precision and flow measurement range can reach 10:1. Ultra-low EMI switching power supply. The power supply voltage varies widely, and the EMI performance is good. The 16-bit embedded microprocessor is adopted, with fast operation speed, high precision and programmable frequency and low frequency rectangular wave excitation, which improves the stability of flow measurement and low power consumption. There are no moving parts in the pipe, unimpeded flow components, and there is almost no additional pressure loss in the measurement. High definition backlight LCD display, full Chinese menu operation, easy to use, easy to operate, easy to understand. It record the total flow every hour, which is also applicable to record every minute. There are three integrators that can display the cumulative amount of positive cumulant and the sum of the difference respectively. And it can record 16 times of power off.